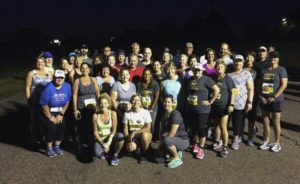 We encourage our members to run or walk for fitness and fellowship, with the intention of training for and participating in organized events. We welcome all ages, fitness levels and training styles. We support and celebrate each member's personal goals. Each year on April Fool's Day, we will invite those who are inexperienced in organized events to join us, and use our experience to mentor them through the annual Akron Marathon Race Series. On April Fool's Day, Paula Schleis, our founder, invited readers of the Akron Beacon Journal and beyond to join her in an adventure that many only dreamed of taking. Walkers and runners, young and young at heart, all joined Paula for an inaugural walk/run, and many can now say they have traveled on foot farther than they thought possible! Each member has a story worth hearing. Join us so we can hear yours!